--Gillian Flynn "a book full of giddy, slangy, devious schoolgirls who cannot be trusted about anything, at least not on the first, second, third or fourth rounds of questioning...Part of this book's trickiness is its way of letting characters hide the truth behind the smoke screen of language and let both readers and investigators gradually figure out who is lying." -- Janet Maslin, The New York Times "There are echoes of Leopold and Loeb and Donna Tartt's The Secret History, but the language and landscape are unmistakably French's, as is the way she excavates the past to illuminate the present." --O Magazine "Terrific--terrifying, amazing, and the prose is incandescent." --Stephen King "Tana French is irrefutably one of the best crime fiction writers out there...[The Secret Place is] dizzyingly addictive...don't miss this one." "clever and crude and vulgar and vicious in one breath and deeply, profoundly tragic in the next." --Marilyn Stasio, The New York Times Book Review "French is such a gorgeous writer: She's a poet of mood and a master builder of plots . . . The Secret Place is another eerie triumph for French." --Maureen Corrigan, The Washington Post "French pegs each [character] with cold, cruel precision, one by one, like a knife thrower popping balloons...it makes the world of The Secret Place pop into prickly-sharp focus and full color." -- Lev Grossman, Time "The Secret Place will keep you up all night." "The Secret Place may be French's best novel yet and that's saying something. She's that good." "rendered vividly, with sharp dialogue and finely observed detail." "Gone Girl fans will revel in this enthralling thriller." --People "[Tana French's] mysteries are less procedurals and more thoughtful, smart, stunningly clever and well-written literary yarns." --USA Today "A twisting, teasing, and tense murder mystery that, while impressive in the matter of whodunit, soars on the psychological insights of whydunit. The Secret Place rips you to shreds, too, but in all the right ways. While channeling teens and cops alike, Tana French has - OMG, like, totes, amazeball - written a novel that seems all but certain to be among the best mysteries of the year"
"The Secret Place is Tana French's latest extraordinary procedural... French's plots are inventive and her prose is elegant, but she's always been more interested in character development. Here, her steely gaze brilliantly nails the baffled and baffling emotions of teenagers on the verge of adulthood." --The Boston Globe "The Secret Place is an absorbing take on a hot subgenre by one of our most skillful suspense novelists." --Popmatters.com "[Tana French] simply nails it...I just could not put it down!" --BookPage "The Secret Place simmers and seethes with skillfully crafted suspense, and French's prose often shines with beauty. But her strongest point is her characters, who are sharply observed and layered into complex and surprising people, revealed both in the wild memories of the flashback sequences and the crushing pressure of the interrogations in the present." 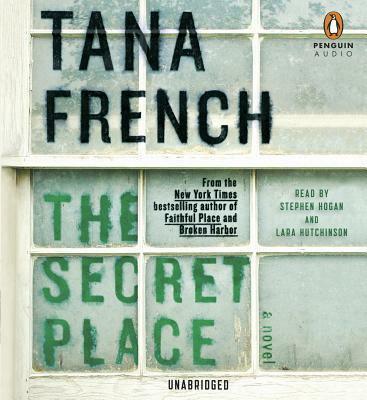 --Tampa Bay Times "If you're a thriller fan and haven't discovered the wonders of Tana French, her latest, The Secret Place, will surely get you hooked, and by hooked, we mean feverishly reading till the wee hours... An exceptional thriller. Be prepared -- but the ride will be worth it." "Mesmerizing...French stealthily spins a web of teenage secrets with a very adult crime at the center." --Publishers Weekly (Starred Review) "Complex characters and a vivid sense of place are at the heart of French's literary success..."
--Booklist (Starred Review) "[Tana French] has few peers in her combination of literary stylishness and intricate, clockwork plotting... Beyond the murder mystery, which leaves the reader in suspense throughout, the novel explores the mysteries of friendship, loyalty and betrayal, not only among adolescents, but within the police force as well. Everyone is this meticulously crafted novel might be playing--or being played by--everyone else." "Tana French expertly lays bare the striations of age, class and gender that keep people apart while making them need each other more. With carefully crafted characters and motives, French not only makes a boarding school murder seem plausible, she makes the reader wonder how teenagers could ever live in such close quarters without doing each other grievous bodily harm."